We update the light curves of V5587 Sgr. 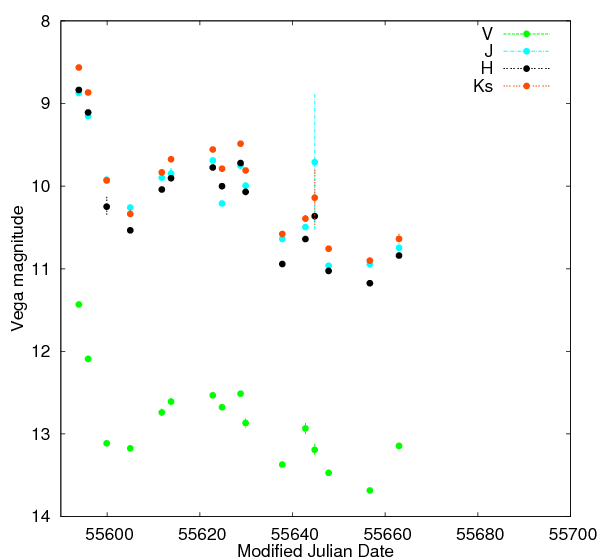 We performed spectroscopic observations of Possible nova in Sco on MJD 55714.599 (2011 Jun. 2.599 UT). The spectrum exhibits the broad H-alpha emission line. The line velocity of its FWZI are roughly measured to be 4500 km/s. This emission line shows the triple-peaked profile. The velocity of these peak components are +1600, 0 and -700 km/s, respectively. 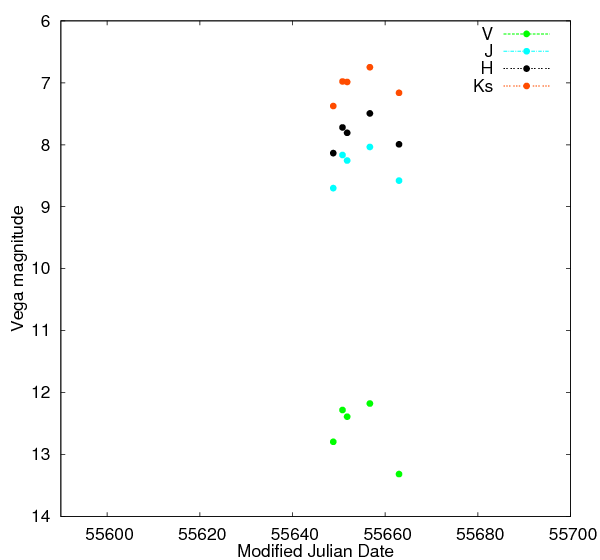 We also identified the OI 7477, 7773, 8227 and 8446 emission lines. These line profiles exhibit the double-peaked structures. The typical peak separations are estimated to be 2.0nm except for OI 8446. These complex line profiles would be reflected by the overlap of the ejected-material. The HeI lines are not seen in our spectra. We will observe this object. We performed the optical and near-infrared photometry of V5588 Sgr. 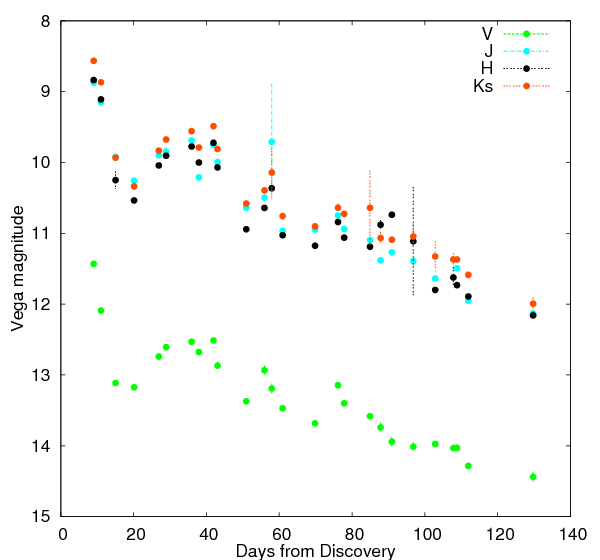 The light curves in all-bands exhibit the rebrightening at around 30 days after discovery. We find that the ejected material did not pronouncedly form the dust. We update the light curve of Nova Sgr 2011. We performed the optical spectroscopic observation of a classical nova V5588 Sgr on Apr. 12. 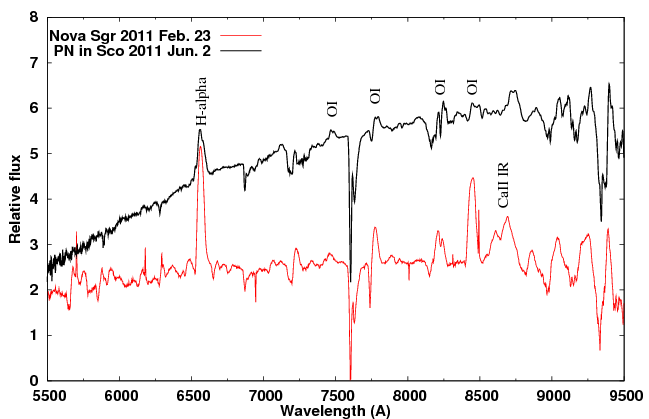 The spectrum exhibits the emission lines of Balmer series, HeI, OI, CaII and FeII. 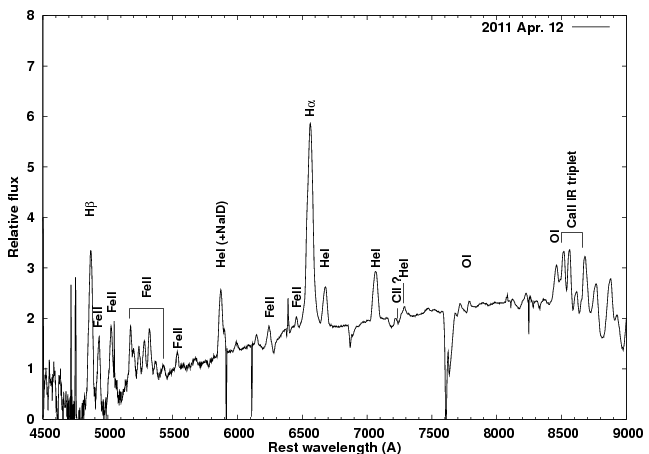 We also possibly identified the CII emission line at 7234 A. The identification of HeI and CII indicates that the photosphere of the nova evolved after the earliest report by Arai et al. (CBET 2679). We will observe this object. We performed the optical and infrared photometric observations of V5588 Sgr (=Nova Sgr 2011 No.2). The light curves exhibit the rapid decline after the luminosity observed at previous observations. They also exhibits rapid reddening comparing to that of the maximum light. ■ [Nova] V5587 Sgr : rebrightening again! We performed the optical and near-infrared photometric observations of V5587 Sgr (Nova Sgr 2011) since Feb. 3. The light curves exhibit the rebrightening by 0.6 mag during a week. This nova has already undergone the rebrightening three times until this. The first one had a longer timescale of 30 days with the amplitude of 0.5 mag than other two ones. Other two ones show rather shorter timescale within 10 days and sharp variations. This phenomena may be similar to be oscillation seen in O-class novae (e.g., V603 Aql), whose classification is suggested by Strope et al. 2010.